Join us for the artist reception for Temporal Narratives from 5:30-7:30pm in the GPAC Lobby before the Storm Large performance. 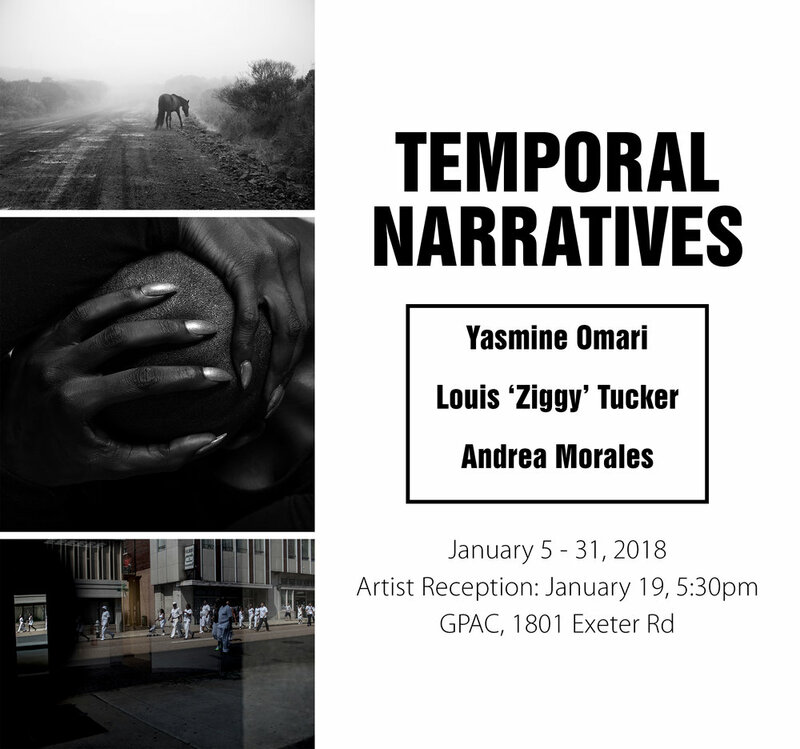 Temporal Narratives is an exhibition of works from three Memphis-based photographers: Yasmine Omari, Andrea Morales and Louis Tucker. Each brings their own perspectives and interpretations to the theme while collectively exploring the idea of narratives being intentionally and unintentionally constructed. Yasmine Omari’s photographs show contemplative isolation and longing within the frame of personal memory and place. Andrea Morales brings a photojournalist’s perspective through her engagement with communities while exploring the idea of time as a social construct. Louis Tucker creates abstract narratives using converging lines and the human body depicted within urban spaces and fluid environments. Yasmine Omari is a Palestinian-American photographer and active arts administrator devoted to serving the community through cultural and fine arts. Omari works at GPAC as the Marketing & Education Outreach Coordinator. She is a Salzburg Global Seminar for Young Cultural Innovators 2017 fellow. Her work is largely influenced by a wide array of filmmakers, artists and writers such as Andrei Tarkovsky, Yasujirō Ozu, Béla Tarr, Jan Švankmajer, Gao Xingjian, Sebastião Salgado, Mahmoud Darwish and W. S. Merwin. Andrea Morales is Peruvian-born (1984), Miami-bred and Memphis-based. After years of existing in spaces heavy with the constructs of socioeconomic binaries, her work moves with the hope of observing the things in between. A decade in community newspapers taught Morales to value both the ceremonial and the mundane while a graduate education in visual storytelling at Ohio University helped her think about giving that life off the printed page. As an independent photographer in the Delta South, she focuses on editorial work through a journalistic and documentary lens. Louis “Ziggy” Tucker specializes in dance/performing arts and aquatic portrait photography. While based in Memphis, Tennessee he has photographed ballet dancers and aquatic subjects/performers from as far as San Francisco to South Africa. In addition to being one of the staff photographers for Ballet Memphis, he has photographed for Opera Memphis and other touring companies such as MOMIX, Cirque Italia and Les 7 Doigts de la Main. Mark O’Connor featuring the O’Connor Band with Special Guest Sierra Hull THE SHOW IS ON!